Luckily for the incumbent micro manufacturers of the UK and the US, the Japanese - whose invasion had been feared since the late 1970s - were surprisingly late to the party. When they did arrive, it was mostly with MSX-specced machines, a consortium effort actually led by Microsoft which included most well-known Japanese manufacturers of the day, including this one - Yamaha - as well as Sony, Sanyo, Toshiba, Teleton, JVC, Mitsubishi, Hitachi and Canon. Yamaha, for its part, along with National Panasonic, had initially held off from entering the UK market. David Potter of Psion, © Popular Computing Weekly, 8th June 1989MSX was originally conceived by Kay Nishi of Microsoft Japan after the company had been contacted to develop the specification as none of the big electronics companies that had founded the MSX consortium had any experience of building home microcomputers. MSX was a single-target hardware spec, utilising the same Z80 processor, TI 9188 graphics, Intel I/O, General Instruments' AY-3-8910 sound chip and requirements for the same ports and interfaces in all implementations, although there was limited scope for each company to add on its own extensions. It was very much of the 8-bit generation but by the time it finally arrived in 1984/85, the 8-bit era was mostly over and the specification, such as it was, was considered by many to be very dull and disappointing. Popular Computing Weekly went as far as to say "Imagine the Japanese car manufacturers getting together and all producing vehicles based on the [ancient] Ford Prefect". Psion's Managing Director David Potter said at the launch of MSX that "Any standard has advantages and disadvantages. MSX will provide a common environment for software development and the consumer will benefit from the wide range of peripherals available for it. The disadvantage is that it could inhibit change. Innovation in the decade to come will be considerable and the question remains whether the MSX [standard] is sufficiently and open-mindedly designed to allow it to become a standard for many years to come". Kay Nishi himself added "I don't deny that 16 bit is coming - but not this year, or in the next two years. Whatever happens, MSX will be upwardly compatible". MSX had been launched in Japan in October 1983, but still hadn't appeared in the UK by the summer of 1984, even though a British MSX Working Group had already been set up at the very start of the year. Headed by Toshiba's UK product manager Chris Greet, the group was aiming to bring all the MSX manufacturers together to coordinate the UK launch of the system as well as encourage software development. In an interview in Popular Computing Weekly during the summer, Greet explained Toshiba's desire to make "MSX [a] world standard in computers, like VHS in video. Any company can manufacture an MSX machine providing it has a licence. There is a licence fee and a commitment to meet the standard - there is a certain minimum specification - joystick ports, ROM slot, cassette interfaces and so on which each MSX machine must have". Clive Sinclair considered this very standard as being the biggest problem with MSX, suggesting that it would hold back and restrict development of the entire microcomputer industry. He also reckoned that it was definitely something that consumers didn't actually want and blamed retailers for the promotional push of the MSX standard, saying the machines were "freezing technology". He continued "I am concerned at the fairly stupid attitude from some British retailers about MSX. They say it's marvellous because there is standardisation, but that's not so marvellous when what they are standardising on is so badly out of date". Sinclair was also concerned that the whole thing was in danger of succeeding because retailers seemed to be choosing to stock it, even though at wasn't "giving the public the best product for their money". Meanwhile Toshiba, a company whose £7.1 billion turnover made even Sinclair and Acorn look like some corner-shop operation, had been building business computers for some time and had also been considering the home computer market for several years. It saw MSX as its big opportunity to break into the UK and clearly hoped to mirror its success in Japan, where it was the current MSX market leader, out of 13 companies there which had MSX licences. That compared to the eight members of the consortium with licences for the UK, none of which were local manufacturers, apart from GEC. 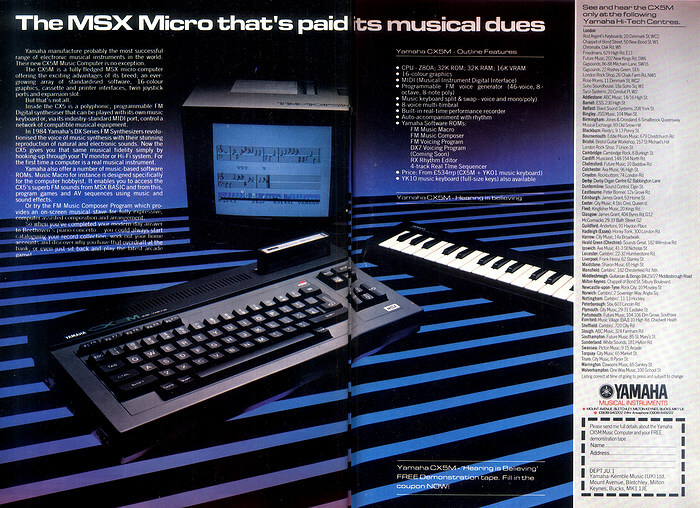 GEC, which had been funding Dragon for several years, had been planning on bringing out an MSX computer in the autumn of 1984, however according to Dennis Judd, marketing manager for GEC Radio and Television, "we were unable to obtain sufficient supplies and as a result have shelved the whole project - there is no guarantee we will pick it up again". GEC had apparently cooled off on the whole home-computer market following the liquidation of Dragon to the extent that once it had sold its stock of the Dragon 32 and 64 it was expecting not to continue in the market. The lack of UK contribution to MSX was a little different with software, with a potential world market and guarantees of compatibility making it a tempting target, and where British software houses were already producing software, the quality of which "[would] surprise a good many of MSX's critics", according to Greet. Upgradability and the constant niggles about such a rigid hardware standard holding back development continued into 1985, so an MSX 2 update with 512x192px 80-column graphics and 128K video was mooted. There was some confusion about how this would allow MSX to continue its claim of software compatbility as Kay Nishi's proposed upgrade path included a switch from the 8-bit Z80 to the 16-bit 8088/8086 family of CPUs. Chris Greet was convinced though that "MSX is not a one-day or one-year wonder - there is a future". As well as MSX2, there was also a proposed "Euro-rival to MSX" called Eureka, aimed specifically at the education market and sponsored by Britain's Department for Trade and Industry and also involving Acorn, Olivetti and Thomson of France. Thomson had recently won a contract to supply "experimental" educational micros based on its TO7 and MO5 computers to the USSR, thanks to Glasnost, Perestroika and Mikhail Gorbachev and computer literacy becoming more important in Russia. 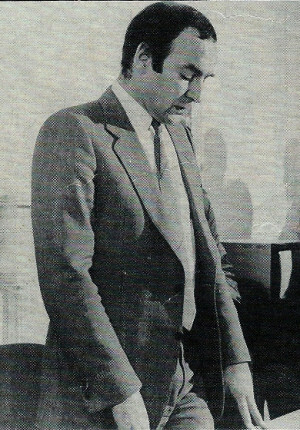 The perenially-glum Chris Curry of Acorn, © Popular Computing Weekly, February 1985Eureka came out of a secret committee formed by the Government in September 1984 to counter the threat of MSX. Under the auspices of the National Economic Development Corporation (NEDC, or "Neddy"), the committee's job was to look at MSX in the wider economic sense, in particular how the standard might apply to domestic applicances, where MSX was intended to be used as a "versatile controlling intelligence" - a sort-of 8-bit AI. One member of the secret committee was Acorn's Chris Curry, and Curry had a particular interest in the threat of MSX as Acorn was also looking to the future of using home computers in control applications. Curry, who had been "preaching the gospel" for a while said in August 1984 that "Stories about home computers being a passing craze must be proved wrong. It is now time to start showing that where they can perform tasks... they will only become an essential part of the home if they do practical things". Curry was also of the opinion that one way to counter MSX in the UK was to ensure that there was "a level of compatibility between products". However, as the first wave of the MSX invasion fizzled out, UK manufacturers didn't eactly look like they were stampeding to the standards table, even though it was likely that a second-generation MSX could prove to be much more dangerous. Also several companies that had real weight in consumer electronics and microcomputers, in particular Amstrad, had been left off the committee. Amstrad was said by Personal Computer News to have "more experience of consumer electronics than the rest of the UK micro industry put together". Digital Research, headed by another champion of the micro as a useful tool, Gary Kildall, was also missing, despite being active in the UK and offering a useful balance against Microsoft, the originator of the MSX concept. By June 1985, manufacturers started furtively showing examples of the updated MSX 2 spec - sometimes known as MSX-E - whilst obviously not wanting to destroy the chances of selling the older, under-specced and over-priced machines no-doubt still floating around in warehouses. They were due to launch in Japan in the autumn of '85, although Toshiba, which had sold more MSX machine in the UK than any other company, albeit only a few tens of thousands, unveiled two MSX-E machines - the HX-23 and HX-22 - at consumer electronics trade shows in London during June 1985. Clearly even rumours of the existence of updated machines was enough to slow sales of the originals. By September, Toshiba has slashed the price of its HX-10, with a re-packaged machine plus data recorder, programming guide and three software packages retailing for only £140. The bundle even came complete with "3amp plugs and a screwdriver" so that buyers could get the machine running right away. The HX-10 by itself was available for only £100, or £300 in 2019. Meanwhile, in Japan, there had also been some price slashing a few months before thanks to Casio. The company, which had long been known for its role in bringing cheap electronics to consumers, had dropped the price of its PV-7 to around £50 via mail order - which itself was a novel approach to selling micros in Japan. Although this left Sony and the other MSX manufacturers feeling threatened, it was perhaps nothing compared to the price of Nintendo's Famicom, which by then was retailing for only £16, an impressive £48 in 2019. MSX never really caught on in the UK - not just because of the dull specification but also because most MSX machines weren't especially cheap, edging more to the £300 mark rather than the £199 of the Commodore 64, perhaps its nearest competitor. Even the software was more expensive, with MSX games released by Activision in the autumn of 1984 retailing at £12 compared to £10 for Commodore versions. 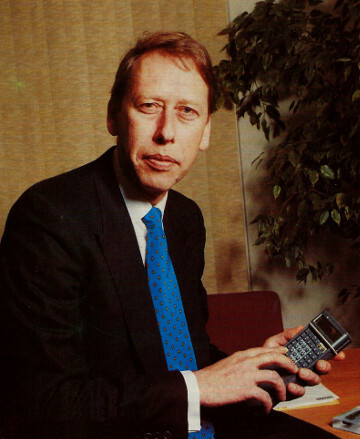 David Kelly writing in Popular Computing Weekly suggested that this was down to the MSX consortium believing that theirs was a whole new "general consumer" market, quite different from the traditional computer market, and so was a market which could bear a higher price for the supposed security offered by the MSX standard. By the spring of 1986 when MSX 2, which was already out in Japan, was ready to roll in the UK, only JVC was definitely intending to launch a machine whilst the remaining MSX manufacturers were being understandably cautious. Pieter Glas of JVC was being more bullish, suggesting that his company wanted "to re-instil excitement and enthusiasm about MSX and we hope to sell it in the UK before the end of 1986". The machine - the HC95 - was being pitched as something of a £1,000 "Amiga killer", as it was being sold bundled with video-grabbing software for a price much lower than that of a comparable Amiga system. Meanwhile JVC's other low-cost MSX2 machine, which it was selling in Japan, was unlikely to be sold in the UK as the the market was unlikely to bear a low-spec MSX machine with a price tag of £250. However, the company was continuing to sell its £169 MIDI adapter, as Glas reckoned that going after specialist markets like music was the "way forward for MSX at the moment". Meanwhile, other MSX companies' plans seemed a bit more vague. Mitsubish appeared to concede that it had "withdrawn from MSX in the UK", and was unlikely to bother with MSX2 either unless "the machine involved was pretty dramatic". Panasonic, which was doing well in Japan, also had no plans either as it currently had no stocks of its machine at all in the UK. Sony was still keen but was hedging its bets as it planned to wait until 1987 to launch its MSX/CD-ROM, with Joe Yakota saying "Our CD-ROM with MSX for business applications [will be] MSX at a very advanced level. It is an area of huge potential". MSX fared better in Europe and by 1987 Philips was also showing a CD-ROM set-up with its New Media System MSX 2-based machine in Spain, whilst the company had no intention of launching the machine in the UK. Interestingly, back at the beginning of 1986, stock broker Wood Mackenzie had predicted a resurgance of the MSX standard in the UK for 1987, even while it had been forecasting reducing overall sales of micros, from 1.1 million in 1985 to only 750,000 in 1986. Just goes to prove how rubbish technology future-gazing has always been. Whilst the UK and the US were worried about Japan, there was another much bigger potential market or threat - depending upon your point of view - coming out of the Far East, in the shape of China, a country with 20 times the population of the UK. China had been coming out of the isolation that followed Mao's Cultural Revolution and was becoming more economically active, but in the computer market it was still way behind. It had an estimated 1,200 mainframes or minis and 125,000 personal computers in the entire country, at a time when there were already millions of micros in the UK, and of those it was thought that only about one in ten were in use, thanks to a lack of English skills. This was clearly, in the words of Personal Computer World, not even enough to buy Jack Tramiel a cigar. According to an article in Personal Computer World by Bob Couttie, the reason that China was not yet making much of an impact on the world of computers was not economic, but language: firstly, high-level computer languages which weren't based on English were non-existant, but secondly it was exceedingly difficult to input Chinese using a computer keyboard, not least because there were thought to be some 150,000 characters in the language. The same problem meant that typewriters had largely passed China by, with the nearest equivalent of a mini typesetting machine requiring some six months of training to use. The solutions to this input problem included modified keyboards that used stroke inputs, or touch-screen technology like Intech's touch-screen CP2054B "Chinese character" processor, developed at a cost of $280,000, although even its final retail price of $5,000 (about £10,100 in 2019) was still too expensive for the home computer market. This, and the idea of transliteration, where a QWERTY keyboard could be used to build up words using phonetics, have perhaps only finally come of age in modern smartphones, where touch-screen phone keyboards like SwiftKey can input Chinese with both strokes and Latin-based Pinyin. Back in the 1980s though, China was still very much the sleeping dragon, but as Bob Couttie concluded - when China finally takes to computers, "there will be fundamental and long-term spin-offs for the west. We, in the west, are in for some real surprises that no amount of star-gazing can foretell. For once the future really is inscrutable". The claimed lack of non-English languages to program with was not entirely accurate, as three years before Cardiff Microcomputers had actually produced a version of AppleSoft BASIC in Welsh. Known as Basicym, it switched rhed for run, llwy for load and apparently gorchymyn anyniongyrchol for "not a direct command". According to Practical Computing, in the style of the casual national stereotyping popular at the time, it was just the thing for calculating revenue for the year's leek harvest. 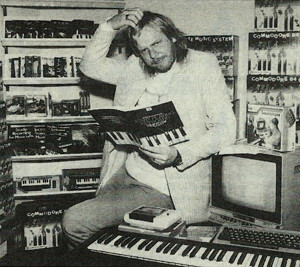 Rick Wakeman looks baffled over the Commodore 64 Music System at the 7th Commodore Computer Show, held at the Novatel in May 1986. © Commodore User, May 1986Meanwhile, whilst other MSX machines may have been boring, Yamaha was at least noted for its musical instrument expertise and this particular machine played to that strength. The CX5M came with a bundled YK01 keyboard and, of particular retro interest, an optional cartridge-ROM version of the legendary 1980s synthesizer the DX7. It retailed for £534 (including the synth keyboard) - about £1,630 in 2019 money. Keyboard legend Rick Wakeman, formerly of prog-rock-group Yes, had even had a go with the Yamaha MSX. His first impressions were that it was an "expensive toy", but later suggested that it was "a very good instrument and extraordinarily cheap for the price". Wakeman was obviously first choice in these matters as he would later also be pressed in to service advertising Commodore's keyboard for its 64 machine at the 1986 Commodore Computer Show in London.